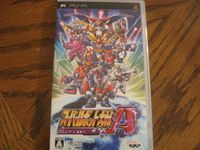 "Super Robot Taisen A Portable is a PSP remake, with enhancements, of the GBA game Super Robot Taisen Advance. The story of Advance revolves around an organization called the Shadow-Mirror, which exists in a parallel world where events happened in a different way than the "Advance" world, thus making the state of the worlds different, though a bit similar at times. Its leader, Vindel Mauser, desires a world of eternal war to make humanity improve more through war. His plan is to send his agents towards another dimension, spy on the defense forces of the world in order to make adjustments on the attack, and eventually conquer it. The player is given a choice as one of the two possible volunteers of the dimensional jump to the "Advance" world from the Shadow-Mirror universe and will later discover through their own way whether the Shadow-Mirror is right or wrong. Axel Almer is one of the two selectable characters. He is one of the top agents of the Shadow-Mirror and is in a relationship with its top researcher, Lemon Browning. He used to be a cold-hearted, but dedicated soldier towards the belief of the Shadow Mirror. If chosen as the main protagonist, Axel will suffer amnesia due to his jump and will develop second thoughts on the Shadow-Mirror's intentions throughout the course of the game. The player may choose the Ash Saver or the Laz Angriff if playing on a real robot route or the Soulgain or Vaisaga on a super robot route. Lamia Loveless is the other selectable character. She is an android created from Lemon's W-Series project, in the hopes she can create an artificial intelligence on par with humans. Lamia is the 17th creation, thus nicknamed "W17". As a machine, she is bound to orders, which is an obstacle towards Lemon's intended purpose on her. If chosen as the protagonist, Lamia's communication device will be damaged in the jump, causing her to develop a broken grammar speech pattern and unable to contact her superiors, allowing her freedom to move around in the mission, while enabling her to develop her own consciousness and making decisions of her own. Lamia can pilot any of the mechs Axel can, with the exception of the Soulgain; in its place is the Angelg. The original robots debuting in Super Robot Wars Advance are based on the original robots in Super Robot Wars 64. The player's choice of the main robot, regardless whether it is a super- or real-type, will affect the beginning of the game, as well as the choice of robots deployed by the enemy. Source: Wikipedia, "Super_Robot_Wars_Advance," available under the CC-BY-SA License.